Even the greats lose their trusty lightsabers from time to time (Anakin Skywalker and his son Luke both being notable examples). That's true on both sides of the Force... the light side and the dark side. Still, we know how difficult it is for a man of Count Dooku's style, grace, and refinement to admit to losing his signature weapon. It's embarrassing! That's why were here to provide an identical replacement discretely and with no judgment! So get back on top and continue your fight against the Jedi and the Republic with this choice Count Dooku Lightsaber Accessory! 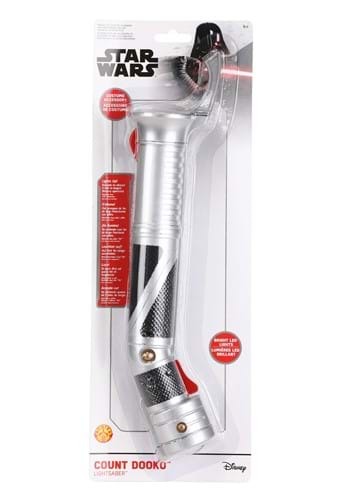 It's modeled after Dooku's unique lightsaber handle, has authentic details, and comes with the requisite telescopic plastic red blade (because there's no feeling in the galaxy quite like igniting one's lightsaber! ), which is two and a half feet long and lights up! A weapon as elegant as the Count Dooku Lightsaber Accessory is sure to become an extension of your awesome dark-side powers in no time!